"Love is a many splendored thing but come the future, could it turn into a deadly weapon? Discover the truth behind this robotic murder mystery tale in the newest issue of our UNIVERSE! series by the artificially enhanced talent of Albert Monteys." 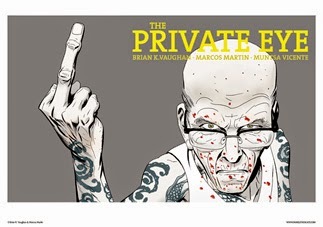 Issue 2 is now available for immediate download at panelsyndicate.com where you can also find the first issue of the series and all issues of Brian K.Vaughan and Marcos Martin series "THE PRIVATE EYE". And don't forget to check out our newest print at http://panelsyndicate.com/shop. Gramps would like to have a word with you. And remember you can keep track of all PanelSyndicate news through our Twitter and Facebook accounts.